Linnet Ridgeway has led a charmed life. Blessed with beauty, enormous wealth and a devoted husband, she has everything anyone could wish for. But as the happy couple set out on an idyllic honeymoon cruise on the Nile, storm clouds are gathering… Linnet’s former friend, Jacqueline de Bellefort, follows her and Simon wherever they go and Linnet senses she is in danger. At first her fears seem groundless. But an attempt is made first on her life and then on her husband’s. Eventually the killer is successful, and Linnet is found horribly murdered. 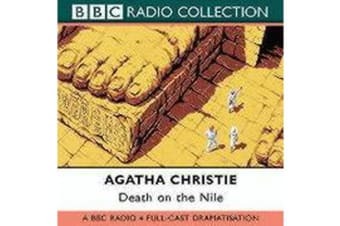 With an obvious suspect who cannot possibly have committed the crime, it is up to Hercule Poirot to probe the depths of a remarkable criminal mind and discover the dark secret behind what is only the first in a series of inexplicable deaths. 2 CDs. 2 hrs 20 mins.